This week at Children's Museum the old saying "you learn something new everyday" has held true! Being a marine biology major, I take pride in being able to bring my knowledge on the subject forward to anyone who is willing to listen. For most of the young kids (and even most of the parents) that come pay us a visit at the Children's Museum, they are seeing and experiencing a lot of things for the first time! From touching a crab for the first time, to casting a fishing pole, its an awesome feeling to see the looks of excitement on both the kids and their parents faces. 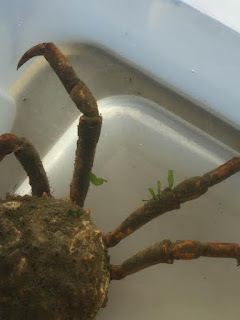 For example, the other day we pulled up a creepy-crawly spider crab from our crab trap. Although it was not the first one we'd seen, it was the first we saw that had seaweed growing off of it! In reality, the seaweed isn't actually growing out of the crab, instead the crab actually attached the seaweed to its shell! In order to protect themselves from predators, spider crabs have developed an almost hoarder mentality of collecting algae and other foliage to create their own make-shift camouflage. In more tropical parts of the world, spider crabs will attach anemones and even pieces of coral to themselves to blend into coral reefs. In Boston harbor however, the dark murky bottom limits these crabs to using algae and other dark plants. Although they might fool their predators, this camouflage is no match for a crab trap when they wander in looking for a mid afternoon snack. 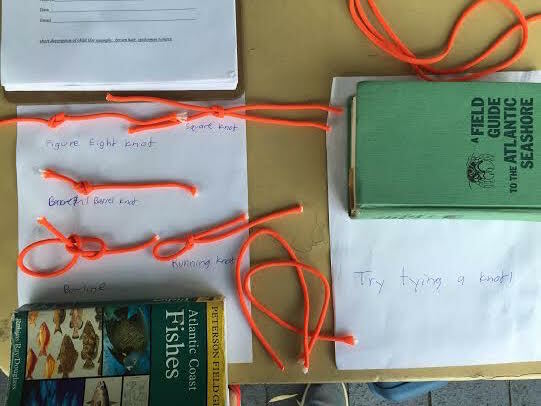 This week we also began implementing a new activity to our program, knot tying! Any professional sailor (or pirate) knows the importance of knot tying, so we thought it might be fun to teach kids and parents alike some of the most common maritime knots. While I've become square knot pro, arguably the easiest knot to tie, Sarah is by far the pro. At first some of the kids didn't seem very interested, but after watching Sarah make the knots look like a piece of cake, everyone was eager to test their knot tying skills. Mine might still need some work, but I'm getting better every day, and now some of the kids and their parents can learn something useful for the future, especially if being a full time pirate is your life goal! I'm excited to see what the coming weeks have in store for us at the Children's Museum, and I can't wait to keep sharing my knowledge of the sea with those that come to visit. Look at all those knots!